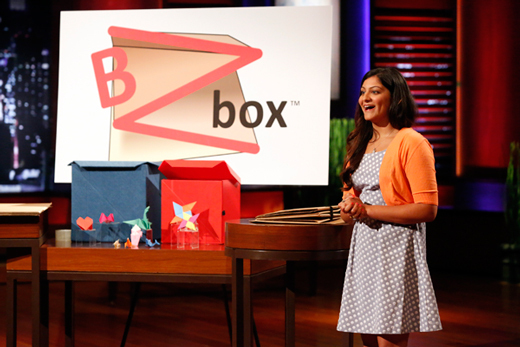 Emory student Kaeya Majmundar appeared on 'Shark Tank' May 16 to seek funding for BZbox, her collapsible, easy-to-use storage box. Photo by ABC/Kelsey McNeal. Emory College student entrepreneur Kaeya Majmundar survived a swim in the "Shark Tank" Friday night, emerging with funding to help take the next steps with her BZbox invention. ABC's "Shark Tank" gives real entrepreneurs the opportunity to pitch their products to a team of all-star — and often highly critical — investors. After intense questioning, some walk away with funding for their efforts, while others just get shredded by the "Sharks." Majmundar, a rising senior in Emory College of Arts and Sciences, appeared on the May 16 season finale, seeking funding for BZbox, a sturdy yet easily collapsible packing box she designed. The invention was sparked by her struggle with poorly assembled boxes while moving out of her freshman dorm and takes its design inspiration from origami. After winning the Collegiate Entrepreneurs Organization's National Elevator Pitch Competition, Majmundar decided to try to get BZbox on "Shark Tank." Her appearance was taped in June 2013, meaning she had to remain mum for months about the results. "It was so hard to keep it a secret, especially because I was in a commercial that they had been airing since the very beginning," Majmundar tells Emory Report. Friday night's episode introduced Majmundar with taped scenes of her at home in Chicago, which made secrecy even more difficult. "I had to get a bunch of my family and friends together to be in that scene," she says. "The combination of both the commercial and the home package let the cat out of the bag just a little bit so everyone was asking when I'd be on." During her turn in the "Shark Tank," Majmundar faced pointed questions, but came away with an investment of $50,000 from inventor and QVC celebrity host Lori Greiner, contingent upon BZbox getting into retail outlets and Greiner receiving a 40 percent share of the company. Now that the episode has aired, Majmundar can discuss the partnership and how BZbox has grown since the show. "I am working on getting into retail," she says. "A lot of big container, hardware and home storage stores have approached me. If you recall, the deal was contingent on getting into those retail outlets so that is my number one priority at this point in time." While some "Shark Tank" entrepreneurs balk at giving up a percent of ownership in exchange for investments, Majmundar says she was "not at all" concerned about giving Greiner a 40 percent stake in BZbox. "I went in there looking for a reliable, knowledgeable and well-connected partner more than anything," she says. "A lot of people ask me why I didn't ask my 'doctor parents' for $50,000. It is true — they could have put their money in, but I would not have really known what to do with it. Lori has been an amazing mentor and I would have made the same decision over and over." Majmundar watched the May 16 episode with about 40 friends and family at a private viewing party at a restaurant near her home in Chicago. "I was so nervous," she says. "I knew what happened already but it almost made it worse because I was not sure what would make it to air and what wouldn't." She recalls stressing to her friends that it isn't easy to deliver a concise pitch to the investors. "Just a few minutes before it aired, I got up to say a few words and I emphasized the fact that pitching to the Sharks is a million times harder than it looks and I was like 'please don't judge me!' Everyone laughed and throughout my pitch, everyone around me was cheering for me and laughing at the funny moments and just so supportive," she says. Majmundar says a producer warned her that the investors would look for the "Achilles' heel" of her invention and business plan. "He told me to be aware of all my product's weaknesses and to have answers for their questions. He was right," she says. "When the Sharks started questioning me, I just tried every which way to hang in there because, boy, they really came at me hard!" Entrepreneurs often appear on "Shark Tank" without receiving any investment offers, and Majmundar admits she thought she might end up being one of them — especially when venture capitalist Kevin O'Leary, known for his ruthless persona, took her to task and bowed out. "The minute Kevin O'Leary went out because he felt like I was disrespectful to him, I thought I was toast," she says. Now as Majmundar works to grow BZbox into retail outlets while continuing her Emory studies as a double major in economics and sociology, she says she's grateful for an experience that still feels "incredibly surreal." "The most exciting thing about being on 'Shark Tank' was literally just the privilege of being there. I somehow beat out tens of thousands of people to get one of those spots and it was incredibly surreal," she says. "I walked into the Tank and literally could not believe it was happening, and even to this day, I cannot believe it. It has been the biggest blessing."